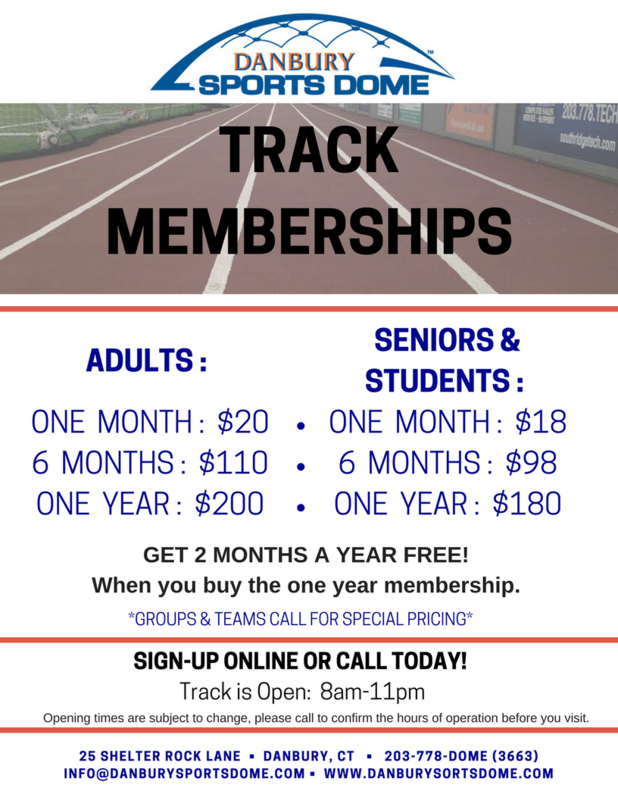 Click here to register for a Track Membership! Need a place to walk, jog, or run? Look no further with the Danbury Sports Dome indoor track. When the facility is open you can exercise at any time between the hours of 8 am and 11pm all year round in a safe climate controlled facility not having to worry about the weather, light, or traffic. Please call to confirm the hours of operation of the track before you visit. For a nominal yearly fee, you can enjoy our ¼ mile track that gives you everything you need. To sign up please CLICK HERE to download the membership application. 1. No Athlete will be allowed on the track without showing the appropriate Danbury Sports Dome Track Membership Card and/or ID at the front desk. 2. All athletes must be properly attired at all times while in the Danbury Sports Dome. Proper attire consists of shorts and t-shirt or singlet or one-piece speed suit. Shoes must have a rubber bottom and no spikes. No plastic bottoms are allowed in practice. 3. The use of spikes is a sanctionable offense, which can result in suspensions to athletes and teams. Multiple offenses may result in suspensions ranging in length from six weeks to the balance of the season. 4. Visitors and spectators will not be allowed to use the track without a track membership or visitor one-day pass and have signed in at the front desk. 5. Patrons, coaches, and athletes will be responsible for following all of the rules of the Danbury Sports Dome and completed all the necessary paperwork required.